My visit was a consult for a possible lumbar fusion in the future and all options i.e. physical therapy and painmanagement. Dr Lemma and his P.A. Steve answered all questions making my husband and I feel completely secure and comfortable. A year ago I had 5 fusions of my cervical spine and 2 fusions of my thoracic by a neurosurgeon and the recovery was and is long and painful with 7 months of P.T. I only wish I had heard of Dr. Lemma a year ago, he put me completely at ease and I will not hesitate having him perform my surgery. I have never heard of a surgeon who offers to give you the phone number of his patients who had the same operation as I would have to talk to them and get their opinion of surgery and recovery. Dr Lemma is a physician you want to run to.. not away ! My visit was a consult for a possible lumbar fusion in the future and all options i.e. physical therapy and pain management. Dr Lemma and his P.A. Steve answered all questionsmaking my husband and I feel completely secure and comfortable. A year ago I had 5 fusions of my cervical spine and 2 fusions of my thoracic by a neurosurgeon and the recovery was and is long and painful with 7 months of P.T. I only wish I had heard of Dr. Lemma a year ago, he put me completely at ease and I will not hesitate having him perform my surgery. I have never heard of a surgeon who offers to give you the phone number of his patients who had the same operation as I would have to talk to them and get their opinion of surgery and recovery. Dr Lemma is a physician you want to run to.. not away ! 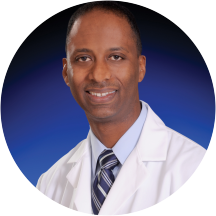 Mesfin Lemma is a mindful and friendly orthopedic surgeon serving the communities of Baltimore and Bel Air, MD. Dr. Lemma attended Case Western Reserve University, where he received his medical degree. Dr. Lemma is a part of MedStar GSH Orthopaedics and is affiliated with MedStar Good Samaritan Hospital in Baltimore, MD. He is board certified by the American Board of Orthopaedic Surgery. Dr. Lemma sees patients for orthopedic consultations as well as other common and specialized reasons. He is sensitive to the uniqueness of each patient's situation and adapts his consultations and treatment options appropriately to accommodate individual needs and concerns. Very knowledgeable, all things I needed to know was explained in detail.